For best results with Streptocarpella Concord Blue Trailing, use a constant feed program of 200 ppm N. A pH between 5.5 and 6.5 is important for the healthiest plant color. Avoid any cold water standing on the leaves as they will be damaged and produce leaf spots like an african violet. 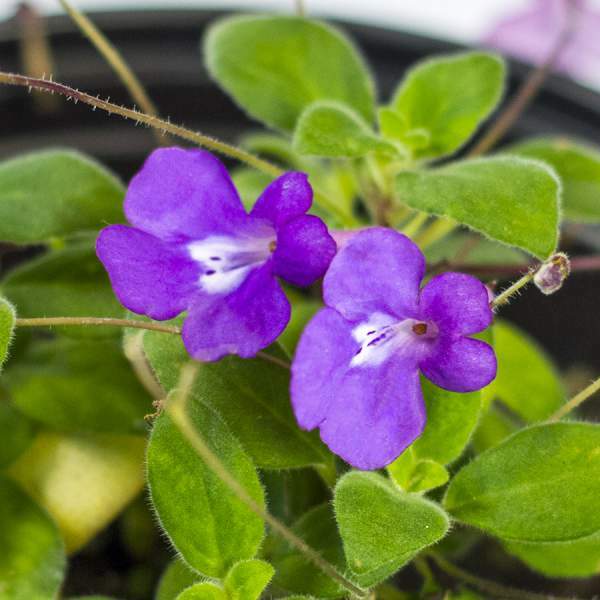 Streptocarpella Concord Blue Trailing do not require pinching, but you can trim larger baskets to maintain their shape if you want. Allow 4-6 weeks after the last pinch for blooms to appear. Streptocarpella Concord Blue Trailing is not prone to many diseases, but don't oversaturate the soil. If the plant sits in moist soil for an extended amount of time, you could end up with root rot or botrytis. Botrytis grey rot is usually associated with wet or humid conditions. You can prevent botrytis by allowing the plant to dry out between waterings, allowing for good airflow in your greenhouse, and spacing to allow the sun to penetrate to the soil level. The most common chemicals used to treat botrytis and root rot are Medallion and Banrot. Use them as a drench according to each label's instructions.